“Everyone wants happiness. No one wants pain. But you can’t make a rainbow, without a little rain.” (Quoted by Dolly Parton) – A quote seen on the Jack’s Winning Words blog some time ago. It’s certainly true that life throws us curveballs from time to time; sometimes much worse than that. Life happens and sometimes it involves pain – the loss of a loved one, the breakup of a relationship or friendship or maybe a major disappointment or disruption at work or the loss of a job or perhaps just overwhelming bills an d problems. We live through these things somehow, but for some that is it – they just survive and live on in misery, unable to let go or go on with normal life. All that they see is the darkness. They aren’t even looking for the rainbow. It’s important, when you encounter someone like that, that you try to help them find a rainbow in their life, something positive that they can embrace that will let them move on. 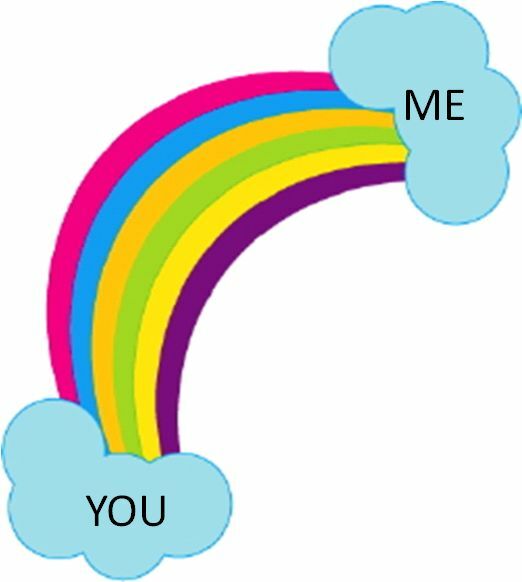 Maybe that rainbow is you and your caring friendship. One of the hallmarks of the depression that can set in with the pain is the feeling of being alone, of feeling like you are the only one who has ever experienced what you are going through. That isolation is self-imposed and just adds to the problem. Just being there for that person, so that they don’t feel alone can make all of the difference. If you’re the one who has suffered a setback in life, it’s important to be able to see past the current trouble and find a rainbow in your life that makes you happy. For many that may be their spouse or their children. For some the rainbow may be their faith, which can certainly be a source of strength and happiness, if you let it into your life. I think one important note is that you will likely find what you are looking for. If you are a doom and gloom person who is always looking for the worst to happen then it probably will (many times with your help). If, on the other hand, you have a positive and upbeat attitude, then things will work out and you’ll find your rainbow. That choice is up to you. So try to find the rainbows in your everyday life and step up and be the rainbow for someone else. else. You’ll be surprised if you do that because you will see the rare double rainbow. This entry was posted on Sunday, June 21st, 2015 at 5:24 pm and is filed under Inspiration. You can follow any responses to this entry through the RSS 2.0 feed. You can leave a response, or trackback from your own site.